What Matters to E-Commerce Brands? From the perspective of an e-commerce brand, an email campaign is about ensuring sale of products. After all that’s where the ROI flows in. Applying intelligent models using product preferences and browsing behavioral segmentation can help deliver campaigns that engage audiences and prompt transactions. However in an aggressive pursuit to ensure maximum sales, brands become compelled with shooting many campaigns, which could clutter the subscribers’ inbox. Here many brands fail to access the risk of email fatigue which being counter-productive; reduces sales engagement. Furthermore, it often prompts subscribers to opt out of receiving further campaigns and offers. Why are Clicks Rates waning? While subject lines compel people to open, web hits paint a better picture whether customer is actually interested in a purchase. 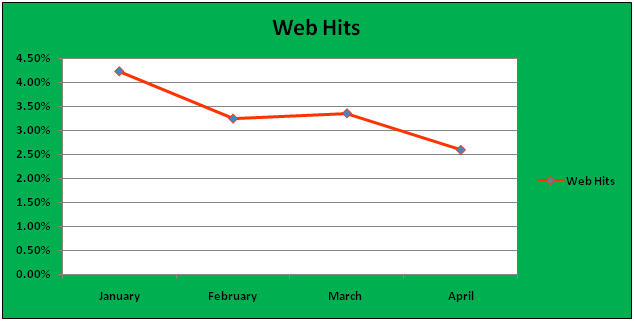 By analyzing web hits one can draw certain conclusions as to how current strategies are faring. iCubes studied the Web hits for an e-commerce brand who were experiencing deteriorating click rates. While digging for data, a correlation established between mailing volumes and declining interests of subscribers. This became crucial in determining better strategies to target customers; having a particular rhythm which prevents email fatigue whilst encouraging engagement. 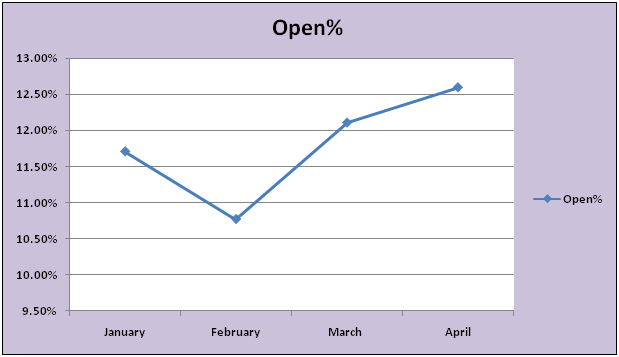 As seen below; open rates enjoyed a good increment with a dip experienced in February. As January is a month laden with end of season campaigns, new-years offers; the dip in February is not unexpected. While January’s mailing behavior can be attributed to February’s dip in open rates, analysis of click rates and CTR reveal a different story. 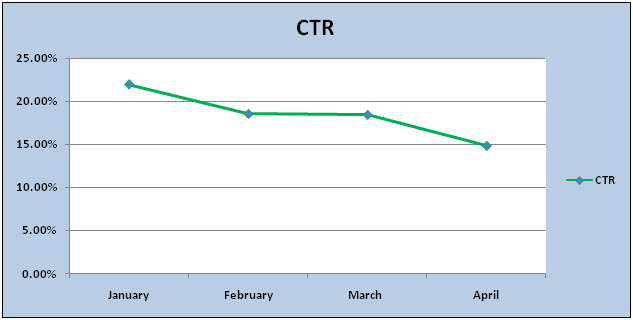 As observed, even with the increase in the open rates observed in March to April, click rates and CTR is on a steady dip. This is a clear indication of lack of interests in offers, probably a result of monotonous content or routine offers. The mailing activities strictly followed three types of segmentation approaches; a segment for Gmail, a segment for non-Gmail users and a third segment bunch based out on shopping behaviors, product preferences, user history among others. As one can see during the months of March campaigns increased for user-profile segments. While over a course of 30 days most subscribers would receive an average of 2 campaigns a day, in the month of March it would average to 3 or more depending on which segments users would be categorized into. Referring to Table 1.1 it is observed that that unsubscribing rates saw a linear increase. 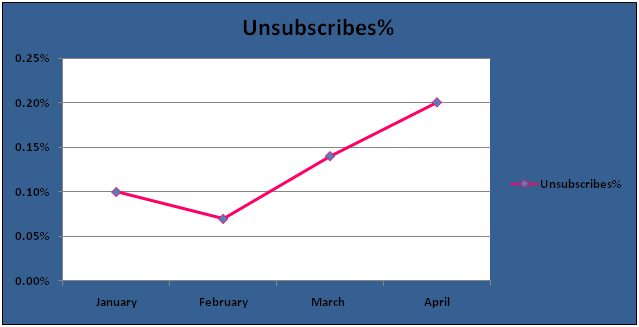 While January experienced 0.1% average unsubscribes, by the month of April the count doubled. With such a sharp increase in unsubscribe rates in addition to declining click rates and CTR; it is obvious that users have lost interest in receiving a bulk of campaigns. While no shopping/transaction can occur without landing on the web-page, the dip in web hits only further support the case of email fatigue. As can be observed a sizeable percentage opted out as they were receiving too many mails. By introducing frequency capping into campaigns, one can deliver fewer yet relevant mailers. Take into consideration the majority of opted-out customers. It shows that subscribers could be getting more mails than they were looking for. In addition if stale content dominates your campaign, disinterest and complacent attitudes would grow. This is clearly indicated that finer segmentation needs to be adopted. A significant bunch has clearly stating that the deals are no longer attractive. Email fatigue does not necessarily mean that too many mails are getting delivered; it means fewer campaigns make the rounds of the inbox which happen to be relevant and interesting to subscribers. Mapping out custom frequencies for various segments driven by behavioral data to deliver engaging and relevant content provides a sustainable environment to improve sales without suffering email overload whilst retaining subscribers.